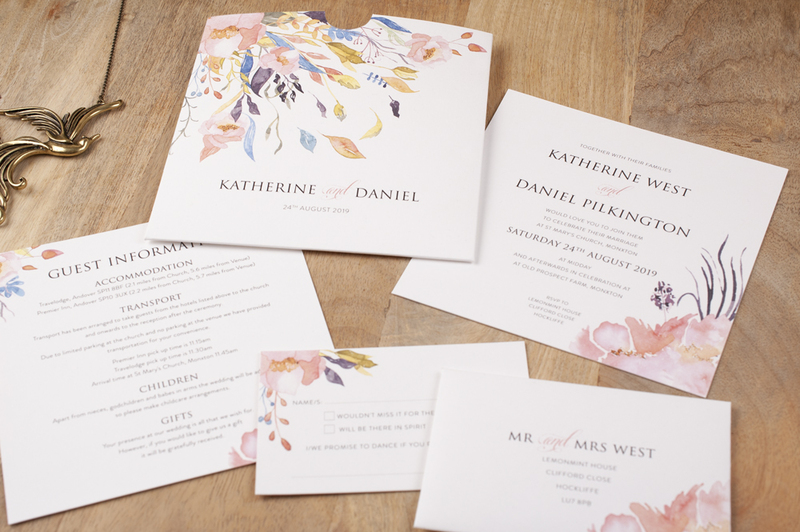 Beautiful Wedding Invitation with Watercolour Flowers - The Blake Style — The Cardlab Letterpress Co.
Digitally Printed this design includes a thumb cut pocket featuring a beautiful Watercolour Floral Motif and an Invitation insert. The Invitation Insert is available in a choice of either 300gsm or Luxe 600gsm card weight. The pocket is created on 300gsm card stock and is perfect for keeping any information sheets, maps or acceptance cards neatly together. Also included are co-ordinating envelopes, which can be lined in a choice of colours. For the perfect finishing touch, we can also print your guests names & addresses on the envelopes for you. Matching Guest Information Sheets (ideal for extra details such as; parking, local taxi firms or gift list details) and RSVP cards are also available. On your wedding day we can also create co-ordinating items including; Order of Services, Table Plans, Menus, Place Cards and Table Name Cards. We have a range of font styles, so you can tailor the typefaces to your preference. You’ll receive your first full colour PDF design proofs within 2 business days. We’re pleased to offer each couple a free sample so you can feel the print quality. To see samples of more then one design you can order a £5 sample pack. Encourage a swift response and include RSVP cards. These are available with pre-addressed return envelopes or as double sided postcard style. The perfect place to include those extra details such as, your Gift List, Travel Info or an Invite to an Extra Event or Ceremony. We offer free full-colour PDF proofs, so you can see your design & play around with ideas before they are printed. Includes the full specification for the Blake Design as well as co-ordinating accessories and alternative colours & styles. We’ve put together a few wording examples as inspiration, but please feel free to compose your own if you would prefer. We can print your guest names & addresses on the invitation envelopes in the typefaces to match your invitations. The perfect finishing touch for your invitations. We can hand-line your envelopes in the colour of your choosing.